I myself am from one of Canada's four atlantic provinces. I spent my entire childhood and early adult life -- up until the end of university -- living there. However, as a destination for exploration and leisure, I was never that interested in poking around in my regional 'back yard'. Perhaps it was the more exotic lure of mysterious lands out west, with more rugged terrain and land elevations above a magical-sounding -- to eastern ears -- ten thousand mark. Those 'real' mountains deserved my attention. So Atlantic Canada remained neglected as the years ticked by and I spent much vacation time in the Rockies, south-western deserts, western coastal ranges, and beyond. Gradually, however, the idea of touring and exploring the wild nooks and crannies of my 'home region' grew. I'd come to realize that it should not always be the very highest point of elevation or the deepest canyon that defines what is worthwhile. I started thinking about broadening my horizons, so to speak. And, those horizons now included Atlantic Canada. 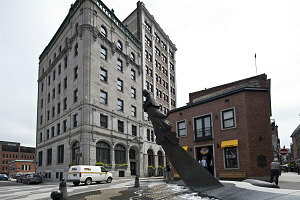 During my formative years, I had visited three of the four Atlantic provinces -- New Brunswick (my home province), Nova Scotia, and Prince Edward Island -- several times, and almost always for some sort of non-leisure purpose, such as going to university, or doing a vehicle swap while working summer months at my dad's car dealership. I had never, however, been to the island of Newfoundland. Not thinking about it too closely, I had always had this vague idea in my mind that Newfoundland was a kind of duplicate of Nova Scotia - and I had seen much of Nova Scotia. This perception stuck with me for a long time. Then, in 2004, I was asked to help with Roland's search expedition to go and look for his lost friends, Dan Pauze and Susan Barnes, in the wilderness of the Torngat Mountains in Northern Labrador (you can read all about that monumental story here). The Torngats are a fantastically wild and remote place - full of rugged peaks, summer snowfields, and even a few active glaciers - all things that I did not, had not, associated with Eastern Canada. I think, down inside, that was the point where I decided that I needed to visit Canada's easternmost landmass -- Newfoundland. The final catalyst to deciding to visit Newfoundland was, on the surface of it, quite mundane: the completion of a section of dusty highway, in 2010, between Happy Valley-Goose Bay and the Labrador coastal highway network. This opened up an entirely new, [almost] entirely road-based way to get to Newfoundland. 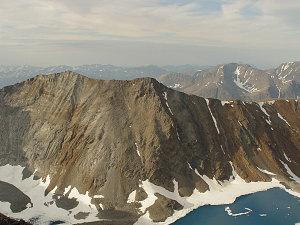 The route travels through huge expanses of wilderness in Northern Quebec and in Labrador, before reaching a short ferry crossing at the closest point between the tip of Newfoundland's Northern Peninsula and the Labrador coast. The idea of 'pioneering' a brand-new stretch of highway through remote wilderness was somehow quite appealing. 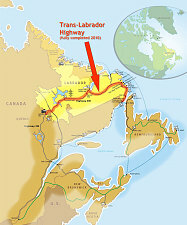 It would also mean that a huge, 'grand circle' itinerary could be constructed - using the newly-completed Trans-Labrador highway to get onto Newfoundland and the existing overnight ferry service between Newfoundland and Nova Scotia to return to the mainland. It sounded sufficiently ambitious and interesting, and so it was a go: a new way to get to Newfoundland: "Overland to the Rock" (in case you don't know, Newfoundland is often colloquially referred to as 'The Rock'). 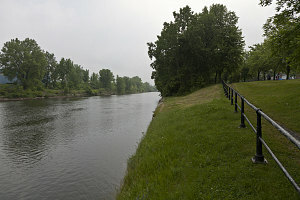 The plan was for the trip to take two weeks at the end of June 2011, starting from and returning to Ottawa. We would do the route in a clockwise direction, heading directly for the Trans-Labrador Highway first, then over to Newfoundland, then return to the Maritimes, where we would spend the last few days visiting my hometown in Northern New Brunswick. 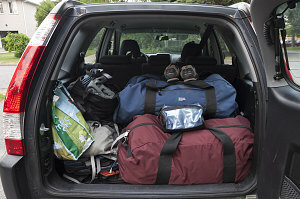 Even though this was primarily a road-touring trip, it was also decided that (as almost all of my trips are) there would be a healthy dose of backcountry exploration, in the form of several overnight backpacks and several day hikes. These were planned for particularly relevant or interesting locations along the route. We left on a warm, sultry Friday evening, right after work. 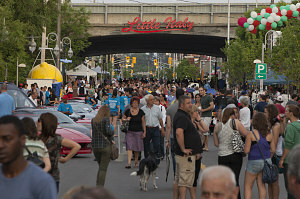 We hadn't yet had time for a bite to eat, so we stopped before heading out of town at the Italian week festivities on Preston Street, which just happened to be getting underway. With Italian exotic cars and gelato stands in the street, we wandered for a bit, bought a few slices of pizza, and enjoyed the fact that we were going to be exploring totally new places for the next while. 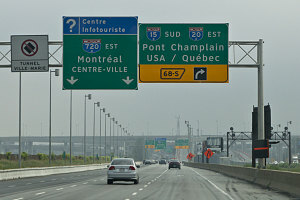 Heading east on highway 417, our first stop wasn't far: Montreal, about two hours' drive away. I was taking the opportunity on this trip to visit a friend I'd made during that search expedition in 2004: Francois had been hired to capture film footage of our search for a documentary about Dan and Sue's tragedy in the Torngats. He followed us everywhere we went, and after a while, we came to enjoy his whimsical brand of wackiness, and we became friends. I'd not seen Francois in a few years, and he graciously invited Jenn and I to stay over for the night. 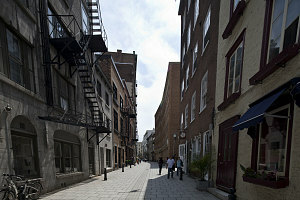 The next morning, after enjoying breakfast with Francois, Melanie, and agent provocateur William, we set off, navigating through the slow, construction-filled streets of Montreal. 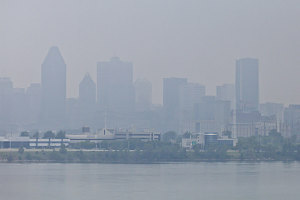 It was a humid and hazy day, and as we crossed over the Champlain Bridge, we could only faintly see the skyscrapers of the downtown. 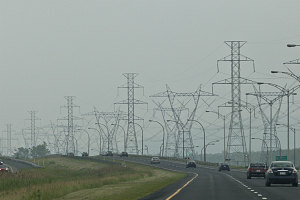 Once outside of the city, we quickly hooked up with Autoroute 20, which carried us north-eastwards towards Quebec City. 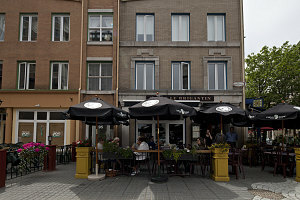 We arrived at Quebec City around lunchtime, and we could think of nothing more delightful than lunch outside under an umbrella at a little cafe in the historic vieux Quebec portion of the city. 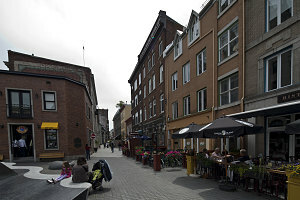 We parked not far from the shops and alleyways of lower old Quebec and walked in a bit, looking here and there for something with nice outdoor seats and a tasty-looking menu. We settled on Bistro la Brigantin, just opposite the maritime-looking sculpture in one corner of the place de la FAO.